The author goes onto describe changes that need to occur in order for these values to rise to the top and ensure continued competitiveness for U.S. manufacturers. Deburr stainless steel, aluminum and other metal sheets up to 0.2" thick with CS Unitec’s ROLEI® BE5. Two speeds enable fine or standard deburring. 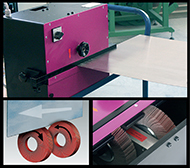 Two abrasive flap wheels rotate in opposite directions to grind both sides of the metal in one pass. 28” guide rail extensions for large, thin sheets. Hussein then goes on to describe a Cincinnati-area company’s 8-yr.-old apprenticeship program, Learn why the company feels the program is worthwhile, even though it costs $220,000 per apprentice trained (over an 8000-hr. period) to earn their bachelor’s degree. The answer for many small- to midsized metalformers is, “Yes,” as cloud enablement allows metalformers and other manufacturers to connect numerous locations, empower mobile engagement by remote workers and simplify collaboration with suppliers and customers. 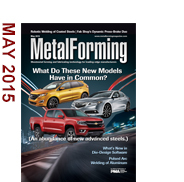 This topic takes center stage at an upcoming webinar produced by MetalForming magazine and sponsored by Epicor. Attend the free 1-hr. session, scheduled for Thursday, June 4, 2:00 PM EDT, to learn why 47 percent of midsized manufacturers expect to transition their ERP to the cloud by 2019. > Reciprocating Surface Grinders Boast Wheels to 14-in. Dia. In many applications, including automotive where galvanized and aluminized steel are increasingly popular, metal-cored wire proves its worth...in and out of the weld cell. Here's why. A manufacturer of high-quality tool boxes reduces setup times to a mere 5 min., while dramatically increasing quality, thanks to state-of-the-art press-brake technology. Plant Manager (NY) / Sussman Automatic Corp.
See also: ETA Dynaform, CS Unitec, Inc.